Recently I was shopping for a ceiling fan to put outside on my covered deck. I researched online and realized that if I wanted my new fan to last, I couldn’t simply pick any style and put whichever one I liked best out there. I learned that there are ceiling fans for indoor use, and then there are special outdoor ceiling fans that are designed for my application. After learning about that difference, I quickly realized that there are two types of outdoor models available. There are damp rated and wet rated ceiling fans, both intended for use outside. However, certain applications require a wet rated ceiling fan, but in others it makes no difference whether a damp rated ceiling fan or wet rated model is used. If you are thinking of installing a ceiling fan under any outdoor structure protected by a roof overhead, then a damp rated ceiling fan is all you will ever need. The reason is that damp rated outdoor ceiling fans are protected from things such as corrosion and such, and all of their components are meant to withstand outdoor elements such as heat, cold, and humidity. They can even withstand a little mist from blowing rain without causing damage, but they aren’t designed to handle direct downpours of rain, and this is why they require a roof overhead to protect them. Damp rated models sometimes use hand-carved sealed furniture-grade wood blades. Although ABS plastic blades are more durable, the real wood creates a much richer look, and goes better with the look of high-end furniture used in the décor of luxury covered patios and decks. The sealed wood will also last just as long in exterior applications, but only as long as the area is covered and the only moisture getting to the fan is that of normal and expected humidity. If you are thinking of instilling a ceiling fan under a structure such as a pergola, where there is no ceiling or true roof overhead, and direct rainfall will be coming down from above onto your new ceiling fan, then you are going to need a wet rated outdoor ceiling fan. The components of wet rated ceiling fans are sealed to prevent any water from seeping into areas where it can do damage. Areas where the wiring comes up from the motor are usually sealed by using silicone in wet rated fans, and if the ceiling fan is controlled by a tradition pull chain, and reversed by a traditional reverse switch, those areas are usually protected by a rubber shield to prevent water from getting in. Outdoor ceiling fans that are wet rated and are controlled only by remote controls do not need the rubber shields, but they will still be sealed to prevent any water from getting into areas where the remote components are hidden. Most wet rated models use ABS plastic blades, instead of wooden blades, and definitely not cheap pressboard blades as indoor budget friendly ceiling fans sometimes use. ABS plastic can withstand extreme heat without warping, and contact with water will not harm an ABS fan blade. Both damp rated and wet rated outdoor ceiling fans can be used indoors. You should never use an indoor ceiling fan outside. 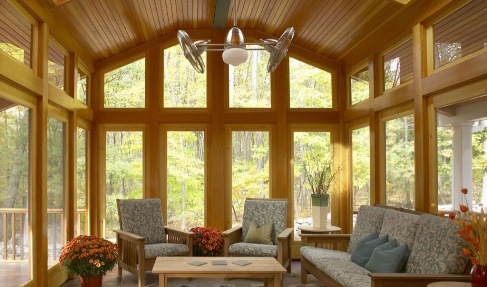 However, it never hurts to use an outdoor ceiling fan inside of the home. Indoor and outdoor ceiling fans are offered with the same control features, the only difference is the way they are sealed and sometimes the materials they are build with. Therefore, if you love the style of a ceiling fan that is outdoor rated, damp or wet, then do not hesitate to use it in your interior décor space. 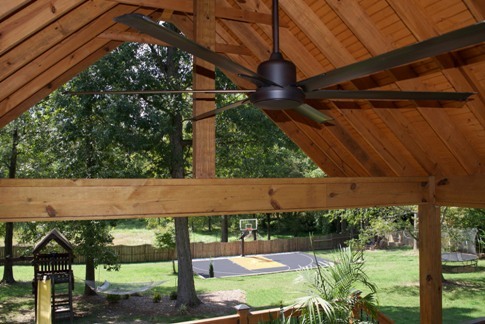 An UL approved outdoor rating is necessary when installing ceiling fans outside of your home. A wet rated outdoor ceiling fan is required if you will be installing your new fan in any area where there will be no roof overhead. An area such as a pergola is one example. A damp rated model is all most will need, because they can be used in any outdoor area as long as there is a roof overhead. Remember, you can always install an outdoor ceiling fan inside of your home, but never make the mistake of installing an indoor only model outside. Indoor fans will not hold up to the elements. Kalau saya lebih suka kipas angin duduk, karena mudah dibersihkan.